Although it was the first permanent English settlement in North America, Jamestown is too often overlooked in the writing of American history. Founded thirteen years before the Mayflower sailed, Jamestown's courageous settlers have been overshadowed ever since by the pilgrims of Plymouth. 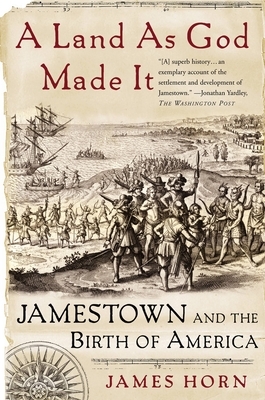 But as historian James Horn demonstrates in this vivid and meticulously researched account, Jamestown-not Plymouth-was the true crucible of American history. Jamestown introduced slavery into English-speaking North America; it became the first of England's colonies to adopt a representative government; and it was the site of the first white-Indian clashes over territorial expansion. A Land As God Made It offers the definitive account of the colony that give rise to America. James Horn is the president of the Jamestown Rediscovery Foundation. He is author and editor of five books on colonial American history, including A Kingdom Strange: The Brief and Tragic History of the Lost Colony of Roanoke and 1619: Jamestown and the Forging of American Democracy. He lives in Richmond, Virginia.